A lobster's slow growth rate combined with overwhelming fishing pressures, led to an 80% drop in lobster stocks around Anglesey in the 1980s. A pilot 'rear and release' restocking scheme set up in 1989 aimed to help counteract these dwindling numbers. Over 3,000 juvenile lobsters have been released since the project started, and this together with a number of other initiatives has helped to improve the local population. To improve the yearly output of juveniles, in order to maintain or improve current local populations. To provide an educational and informative exhibit about all stages of the lobster life cycle, the hatchery set up and the local fishery. To provide a site where further research can be undertaken, looking at ways to improve husbandry, releasing and monitoring techniques. The hatchery uses egg-carrying female lobsters ("berried hens") caught from the wild as brood stock. They are kept in special holding tanks until their eggs hatch into larvae. The larvae are transferred into rearing bins until they develop into “Stage IVs” (This is when they begin to resemble an adult lobster in appearance). There are no predators to reduce numbers, but the tendency of larvae to attack each other still limits the survival rate in the first few weeks of development. When they reach Stage IV, they are removed and put into individual holding cells to be grown on. They are fed daily on a highly varied diet to mimic that found in the wild. The majority of juveniles are released at between 3 - 6 months old, with only a few kept on for the aquarium's display. Sites are chosen which are rocky and have plenty of seaweed cover to give the juvenile the best possible protection from predators. Previously 150 - 200 were released each year, but the improved facilities should increase this 3 or 4 fold. As well as releasing juveniles, the females are also released back into the wild. 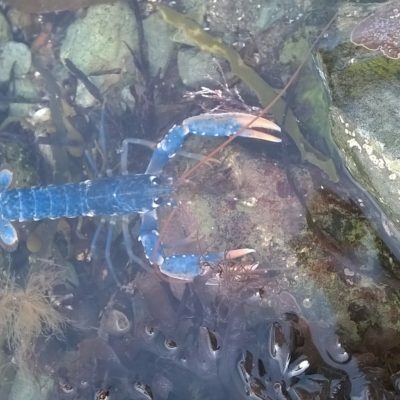 Schemes such as juvenile releasing, together with an increase in the legal minimum landing size to 87mm, has steadily helped improve the local lobster stocks over the last decade. 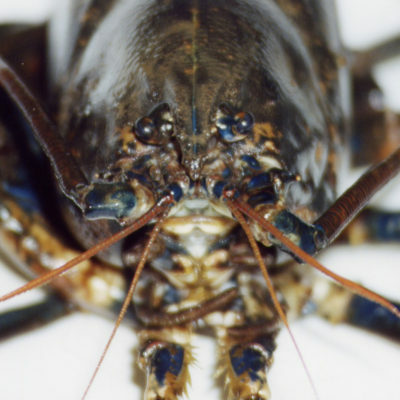 The European Lobster is a crustacean, a group which also includes the following: crabs, prawns, shrimps, sand hoppers, squat lobsters, crayfish, crawfish and barnacles. These invertebrates are distinguished by their extremely hard outer shell that protects all the soft internal tissues. The European lobster is usually a blue/black colour, due to a pigment called astaxanthin in its shell. It is this that also turns pink when the lobster is cooked. The colour is made from several different parts - blue, red, and yellow pigments. Occasionally one or more of these colours can be missing, producing an unusual coloured lobster. These can be bright blue, red, calico (yellow and white) or very rarely - albino. Lobsters have 10 limbs, the back 8 are used for walking and the front 2 are highly modified into huge claws that can be used for both protection and obtaining food. The larger crushing claw with its uneven nutcracker shaped edges is used for breaking open the shells of its prey. The slightly smaller cutting claw has a razor sharp edge for slicing. The red antennae are used to obtain information about the environment. The longest pair (longer than the entire body) together with fine hairs along all the limbs, are sensitive to touch and detect vibrations in the water. The 2 smaller pairs can pick up chemical signals in the water. The head and front half of the body of a lobster are fused, but the back half is made of segments all the way down to the tail which is a fan shape. Lobsters, like all crustaceans, grow by moulting. The hard outer shell is shed in one piece to reveal a soft shell, which can be stretched as the lobster swallows lots of water. During this process the lobster can grow up to 10% larger and also allows limbs that have been lost to regenerate. Moulting is quite a risky process as the lobster can get stuck in its old shell and is defenceless whilst its new shell is still hardening off. 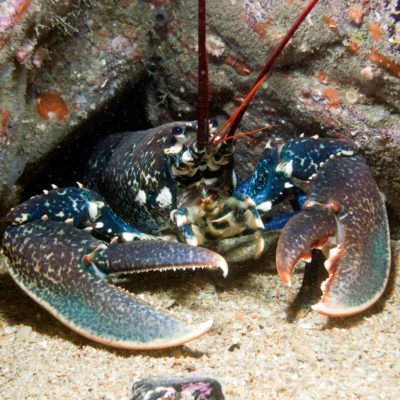 The period between moulting and the time take to harden its shell becomes longer as the lobster grows - fully grown adults only moult once a year and take nearly a week to harden. 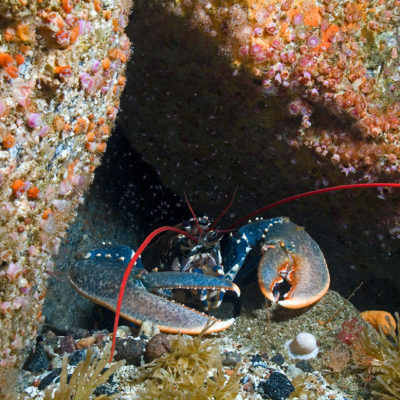 European lobsters are found in both the North Sea and along the west coast of Great Britain all the way down to the Mediterranean, preferring rocky areas that have plenty of caves to hide in. They are nocturnal, venturing out of the safety of the cave only to scavenge for food. Lobsters are also very territorial, and will kill or inflict serious damage to another lobster that comes into its space. The oversized front claws of a lobster are designed to break into hard shelled creatures such as mussels, cockles, crabs and also other lobsters. It will also take small fish, squid and prawns if they come close enough to catch, or dead or dying creatures that sink to the sea bed. The food is broken down as it works its way through the 3 stomachs, the first of which has a set of grinding teeth to help break up the food, especially shelled creatures into smaller parts. Female lobsters mate in the autumn and carry the developing eggs under their tails until the spring. 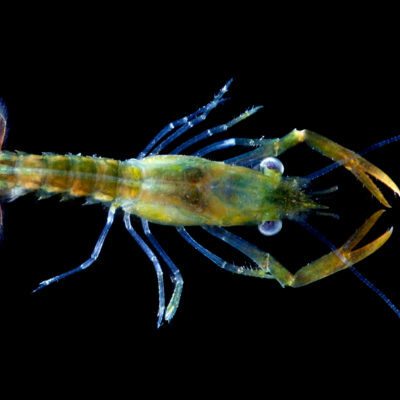 These females, known as berried hens can carry up to 20,000 eggs which are held until they hatch into free swimming larvae. 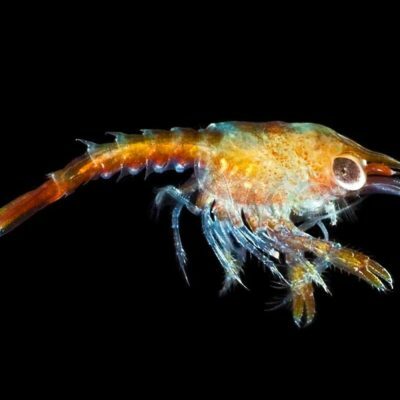 These larvae move towards the light (photo-positive) spending 3 - 4 weeks swimming in the plankton in the sea's surface waters. This allows them to use sea currents to disperse, but makes them very susceptible to predation. During this period they undergo several moults, changing shape slightly each time until on the 3rd moult ( known as Stage 4) they look like perfect miniature adults (about 2cm long). Less than 1% of the original larvae will make it to this stage. At this stage the juveniles then settle on the sea bed, sheltering under rocks and in crevices and scavenging for any food found on the sea bed. It will take 5 to 7 years for the lobster to reach marketable size (depending on the temperature and food in the area it inhabits) and often even longer to reach maturity.